Go For Broke National Education Center (GFBNEC) will present its 14th annual Evening of Aloha Gala Dinner on Saturday, Sept. 19, beginning at 5 p.m. at The Westin Bonaventure Hotel & Suites in downtown Los Angeles. The event is co-chaired by Consul General Harry Horinouchi and his wife, Sabine Horinouchi; Masashi Oka, executive chairman of MUFG Americas Holdings Corporation and MUFG Union Bank N.A. ; and George Sugimoto, founder of KGS Electronics Inc. and president of the Sugimoto Family Foundation. 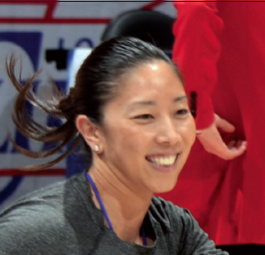 Natalie Nakase is assistant video coordinator for the LA Clippers. Local basketball legend Natalie Nakase will be the keynote speaker. Nakase played starting point guard for three seasons at UCLA and is assistant video coordinator with the L.A. Clippers with dreams of becoming the first woman to coach in the NBA. David Ono, anchor at ABC7 Eyewitness News, will return as master of ceremonies for the event. Once again a spectacular menu awaits dinner guests, created and prepared by Chef Roy Yamaguchi of Roy’s Restaurants Worldwide and Chef Akira Hirose of Maison Akira, with dessert by Chef Scott Smith of King’s Hawaiian Bakery & Restaurant. The Evening of Aloha will feature both live and silent auctions and an opportunity draw for a 2015 Honda Accord EX-L Sedan. Auction highlights include two exciting trips. One is a seven-night stay with airfare for two to Windjammer Landing Villa Beach Resort in Labrelotte Bay, St. Lucia. The luxury villa accommodates four and the travel package also includes a sunset cruise for four. The other is a trip to Japan featuring two business-class tickets on ANA airlines to Tokyo with six-night accommodation at Keio Plaza Hotel Tokyo. Proceeds will support GFBNEC’s mission to educate the public about the responsibilities, challenges, and rights of American citizenship by using the life stories of the Japanese American soldiers of World War II. This has been a landmark year for GFBNEC. The organization broke ground on the new Education Center, located in the historic Nishi Hongwanji Temple in Little Tokyo. Scheduled to open next spring, the learning center and exhibit will be a full sensory experience designed to teach history, civics, and activism in a hands-on environment. In addition, GFBNEC has been developing the definitive online collection of Nisei veteran oral histories, photos and documents. The archive will be accessible globally on the web at the end of 2016. For additional information or to purchase tickets, visit http://goforbroke.org/EOA/index.php.